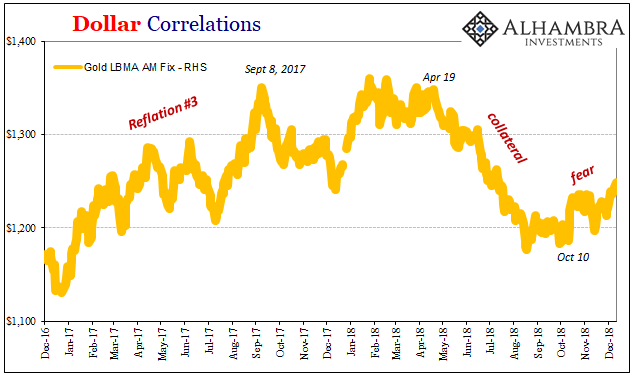 Alhambra Questions The "Curious Rush To Combine German Banks"
Markets this week celebrated more bad news out of Germany. Misunderstanding especially in stocks is par for the course, not that it’s much better outside of them. German officials are laying the groundwork to change the nation’s banking laws so that it’s two largest banks, really “banks”, can more easily combine. If it should ever come to that. The major sticking point seems to be legal structure, no surprise. DB would have to convert to a holding company triggering revaluation of assets and then the tax consequences of those. Unless, of course, auditing the bank’s standing book reveals other malformities taking things in a different direction. It’s not just the rush toward marriage, it’s more so who with. 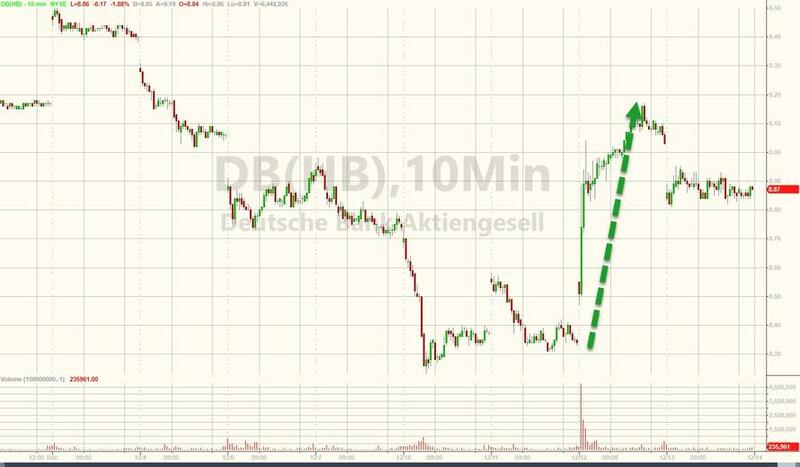 DB is both the target and the presumptive acquirer, an already odd situation. And if there is a healthy counterpart to DB’s sickening status it’s surely not Commerzbank, the institution being whispered up for combination. The only thing, the only thing, CBK has going for it at the moment is its largest current shareholder – while around 55% of shares are held by institutional investors, including vehicles like hedge funds and mutual funds, the most concentrated in any single owner is the ~15% stake held by the Federal Republic of Germany. It would certainly combine risks, wouldn’t it? One way to open the door to emergency “capital” would be if the government was already a significant sponsor. But that’s not what this is about, officials claim. They keep saying this is all the other way around – that a strong German banking giant will therefore be in position to bail out Germany should it ever require it! Belatedly recognizing the dangers of financing an export-led economy during these sorts of troubles, authorities are getting only half the picture (only somewhat on purpose). Discussions of a tie up of two banks with large overlapping businesses signal dwindling hope that Deutsche Bank will be able to break out of a vicious circle of declining revenue and sticky expenses. The stock has dropped more than 50 percent this year and broken through multiple record lows on the way down, while funding costs have continued to rise. All of these things are related, furthermore connected to Germany’s vulnerable external financing requirements (“dollar short”). DB’s, as Commerzbank’s, declining revenues and overall position indeed have led to a great contribution to the global “dollar shortage.” The “dollar short” persists regardless, meaning that rock has met hard place; “funding costs have continued to rise” because these things become self-reinforcing. The eurodollar system is complicated, of course, but the plight of Germany’s financial elephant really isn’t. We’ve chronicled the sordid tale for going on half a decade now. DB’s big sin was in 2014 they listened to Ben Bernanke and Janet Yellen. The bank raised significant capital early on in that year ostensibly to complete its comeback from the 2008 break. Having been fixed, and compliant with new regulations in full, what did DB’s management decide was its best course? 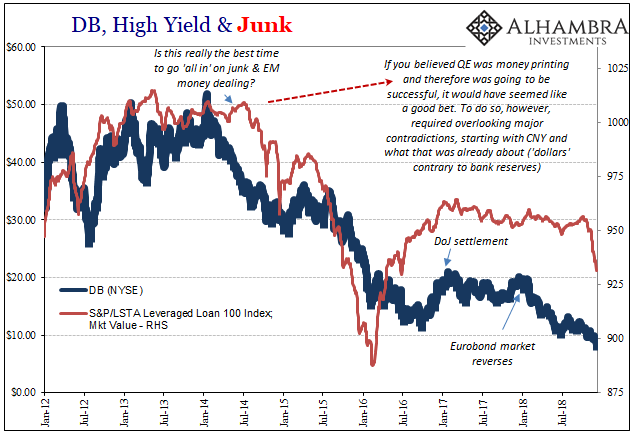 Unlike most of its other peers who were actively retreating, Deutsche plunged headlong into the riskiest assets – global junk, including US corporates as well as US$ EM junk (Eurobonds). The Leveraged Debt Capital Markets (LDCM) franchise combines a premier high yield bond market business with diverse debt financing capabilities. 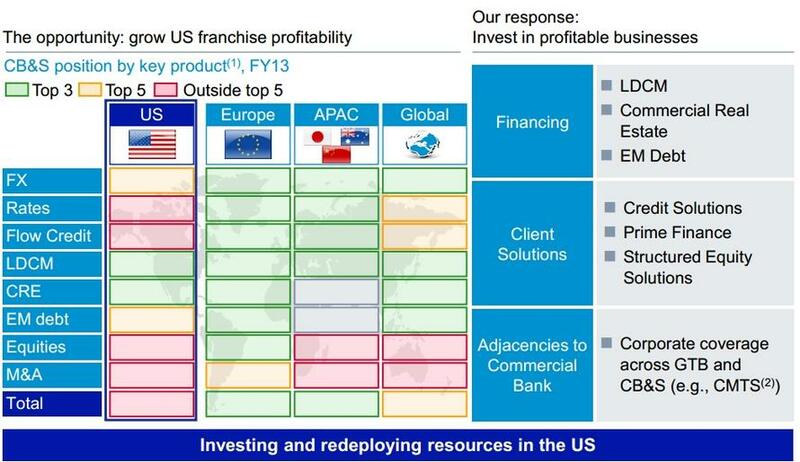 LDCM is a leader in European leveraged finance and is at the forefront of innovation in all aspects of the leveraged debt capital markets and is one of the few franchises that can price, structure, underwrite and distribute senior, mezzanine and high yield transactions on both sides of the Atlantic. It seems as if the world’s Eurobond binge of 2016 and 2017 was only enough to stabilize the bank’s position, and stock price, until that market turned violently wrong starting last December. By January 2018, it was clear another EM crisis was on deck and the Eurobond market was going to be front and center in it. But that’s not what anyone talks about, simply because it can’t be. The global economy is recovering in a virtuous circle started by the genius of technocratic central bankers; banks do better for monetary policy and therefore invest like DB in the various required facets of the global economy, which does better for the resources and so on. Globally synchronized growth would have meant this bet paying off spectacularly. Why? As DB makes plain, there are only “5-6 FIC players left” and there exist exceptional barriers to entry ensuring smaller banks stay smaller. This oligarchical structure is perfect for DB in “attractive products”, such as high yield and leveraged lending (both can fairly be termed the modern incarnation of junk). FIC, or FICC as its alternately known, is the guts of global money dealing in the eurodollar game. Most of the big banks had shed as much of it as they could over the years of this “recovery” – again, self-reinforcing whereby the less banks participate in money dealing the less likely the economy can grow constrained by lack of (credit-based) monetary growth alongside. This explains why DB and other banks have struggled despite constant claims of successful recovery. DB saw opportunity to be one of the few left even more exposed to US and EM junk and the FICC plumbing, if you will, behind it. We’ll likely never know the full details, including potential collateral transformations and the risks of them, but we can easily and reasonably connect how if US and EM junk are having a bad year (or four), “funding costs have continued to rise” makes perfect sense in a way legal troubles, DoJ fines, or this particular bank being in anything like a reasonable position to rescue the largest economy in Europe never could. Officials can’t say that, though, because things are booming. Aren’t they? Being in a sort of rush to change German law isn’t quite consistent with all that, though. Prudent government planning wouldn’t be limited to just the one scenario.